Correction: There is no law under the Kurdistan Regional Government which allows Kurds to take ownership of abandoned Christian or Yazidi buildings. An earlier version of this story incorrectly described the law. Update: The KRG announced plans Tuesday to rebuild Yazidi villages in Sinjar for its original inhabitants, not for Kurdistani factions. Iraq's Assyrian Christians and Yazidis face an uncertain future, and advocates claim that the Kurdistani Regional Government (KRG) intends to prevent the minority groups from returning to the lands they fled in 2014 when ISIS took over. They also don't forget that the KRG and its Peshmerga militia fighters refused to defend them from the ISIS onslaught in 2014. The Kurdish Peshmerga disarmed Christians and Yazidis prior to ISIS's June 2014 rampage across Iraq. Survivors of the ISIS onslaught told the Daily Beast in August 2014 that Kurdistani authorities and the Peshmerga misled them and abandoned them when they came under attack. Bitter feelings remain even after Kurdistani and Yazidi forces and ended the terrorist group's presence in the Sinjar province in December 2015 where most Yazidis lived and freed several Christian towns from ISIS control last October. Khalid Hayder, a Yazidi living in West Virginia after serving as a translator for the U.S. Army in Iraq, expressed bitterness about how the Kurds "betrayed" the Yazidis and the Christians by leaving them to be wiped out. "My fellow Yazidis and my brothers and sisters the Christians are going to face the same horrific tragedy once again if the Kurds dominate the region unless there is international protection," Hayder said. State Department officials formally designated both religious minorities as genocide victims last year. Prior to June 2014, Iraq's Christian community numbered around 350,000, a fraction of the estimated 800,000 to 1.4 million Christians from various sects who lived in the country prior to the 2003 U.S. invasion. The history of the Christians and other religious minorities in Iraq and Syria offers little expectation that the Kurds will protect them, Hayder said. He claims that many crimes against the Christians and Yazidis were committed under the Kurdistani flag. Not everything is simple. Hudson Institute religious freedom expert Nina Shea notes that the Kurds feel overextended and that they are stretched very thin by their approximately 500-mile front line. "They [claim they] cannot take more security responsibility for Nineveh unless they claim Nineveh," Shea said. Kurds are blocking Yazidis from returning to Sinjar, said Jeff Gardner, director of operations for the Restore Nineveh Now Foundation. "They won't even let them bring food and spare parts in for things like cars and people. And they are moving into cities that the Islamic State has been driven out of and saying, 'See these are abandoned' and making legal claims. Many of those making legal claims [for the abandoned properties] are Kurdish businessmen." U.S. Sen. John McCain, R-Ariz., complained about "reports of land confiscation and statements you have made regarding Kurdish territorial claims to the Nineveh Plains region" in a letter last May to Kurdistani President Masoud Barzani. No one seems to want to help the Assyrians reclaim their properties, Kaldo Ramzi, foreign relations director of the Assyrian Democratic Movement (ADM), told the Investigative Project on Terrorism (IPT) in an email. His people feel trapped between the "big sharks" – the Shias, Sunnis and Kurds – without much of a voice of their own, Ramzi said. Kurdistani officials need to explain their blockade and their allowing these businessmen to seize Yazidi and Christian homes, Gardner said. Complaints made to the Kurdistani government in Erbil have fallen on deaf ears, Ramzi said. Ensuring that the Assyrian Christians and Yazidis can return to their homes is in the U.S. national interest and the State Department should take steps to ensure this happens, Shea said. "If they feel that they don't have any hope there, if they don't have justice and rights to their land – the lands that they own – then they will disappear; they will leave," Shea said. "They will emigrate out of there, and that will be the end of diversity and pluralism in Iraq." 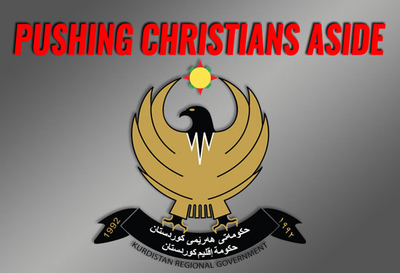 A KRG representative told the IPT that Christians and Yazidis are being kept away for their own good, claiming that ISIS littered their villages with improvised explosive devices (IEDs). That's not true, Gardner said. "I have been through the liberated areas. I have sent reporters into the liberated areas, and they are not full of IEDs," Gardner said. "And even if they were, they have a force trained by the American military – trained by the forces of Delta Force – that can deal with the clearing of the IEDs and explosives." Kurdistani authorities also keep the Nineveh Plain Protection Units (NPU), one of two ethnic based armed units legally recognized by Baghdad, bottled up in refugee camps rather than letting them into areas freed from ISIS control. Moreover, the Iraqi Kurds blocked an Assyrian request to recruit 1,000 extra troops for the NPU under the umbrella of their joint command. The NPU currently has somewhere between 400 and 500 men. Kurdistani security forces also try to prevent NPU soldiers from returning to their units when they get back from leave, an NPU representative told the IPT. The U.S. government has tremendous leverage over the Kurds, Shea said, and should review Kurdistani treatment of Assyrian militia members. "There is no other solution for security for Christians other than their own militia," Shea said. "Unless there is a big plan on how to make the Christian areas and the Yazidi areas of Nineveh safe, they have to have their own militia. Otherwise it stands to reason that they cannot live there." Obama administration officials never bothered to develop a plan to protect the Christians, Yazidis and other minorities from the major powers in Iraq, Shea said. Since the end of the 1991 Gulf War, Barzani has worked to permanently displace religious minorities and increase the Kurdistani population the Nineveh province, Gardner said, as part of a long-term plan to build a greater Kurdistan. Sunni Kurds have settled into Assyrian Christian and Yazidi areas to help stake a claim to their land. This plan aims to extend Kurdistani authority beyond the firm boundaries found in Iraq's 2004 constitution by expanding its de facto control westward to the Syrian border and southward into the Sinjar region where most Yazidis live, Gardner said. Two weeks after capturing areas around Khazir in Nineveh governorate last June, Peshmerga commander Hadi Halabjayi declared them "Kurdistan's now. We will not give them back to the Iraqi army or anybody else." Human Rights Watch cited Halabjayi's statement in a report last November, noting that Assyrians, Yazidis and other minorities complained about heavy-handed tactics against those opposed to the Kurds expansionist plans. These tactics included arbitrary arrests, detentions and intimidation. This is nothing new. Assyrian Christians complained about the illegal settlement of Kurdistani families on Assyrian land in the early 1990s. The ultimate strategy aims to unify Iraq's Kurds with those in Syria and Turkey in a broader Kurdish state, Gardner said. But Turkey considers Kurdish independence a nonstarter, so realizing the Kurdish dream is sure to incite the Turks and put ending Syria's civil war out of reach. The Peshmerga have Assyrian and Yazidi units, the KRG office in Washington told the IPT, and it called Gardner's claim that the Kurds have been harsh to the religious minorities "completely false." The best possible solution would be the creation of a separate province for Assyrians and other minorities, Ramzi said. This also includes Catholic Assyrian Christians known as Chaldeans. "... [A]ll the Cha[l]dean Syriac Assyrian political parties ... demand [an] International protected zone to monitored by international community," Ramzi wrote in an email. "The popular demand for Nineveh Plain is to become new province and for sure we should ask Iraqi government for that." The article published on February 14, 2017, 'Advocates: Kurds Keeping Christians and Yazidis From Going Home' makes unsubstantiated and blatantly false claims that are an affront to the longstanding culture of coexistence in Kurdistan, the protections afforded to Christians, Yezidis and other minorities in the Kurdistan Region, and the 1,654 Peshmerga, men and women of Muslim, Yezidi, Christian, and other backgrounds, who sacrificed their lives to liberate areas throughout Sinjar and Nineveh. Rather than answer every point in the article, which would take too long, we will point out some of the broader false arguments it makes. The premise of the article is that Kurdish authorities are working to displace religious minorities permanently as part of a long-term plan to build a greater Kurdistan. This is grievously false. The article omits to mention that the Kurdistan Regional Government (KRG) was the first government to designate what ISIS did as genocide, and we welcome the US and UN's designations of genocide. We have been the loudest advocates for an international investigation into ISIS's crimes and for an international court to hold the perpetrators to account. The KRG has supported the idea of autonomous areas administrated by Yezidis and Christians. It is critical that those plans and ideas be developed and implemented by the people on the ground and not outsiders and activists with little regard for the facts or for actual sustainability. Sadly the article quotes from unreliable and highly partisan sources who have an agenda to undermine the Kurdistan Region in the misguided belief that by doing so they will garner more support for the Christians and other minorities. The vast majority of Christians and Yezidis, both in the United States and in Kurdistan, support the KRG's effort. Their voices and the voices of neutral parties who are ready to tell the truth are not heard in this article. It is no accident that since 2003, hundreds of thousands of Christians have been fleeing Baghdad, Mosul and other parts of Iraq to seek sanctuary in Kurdistan, nor that in 2015 the KRG celebrated the Assyrian Church of the East's relocation of its seat from Chicago to Erbil. After ISIS, almost all the remaining Christians and Yezidis joined them and are now safe in Kurdistan. They knew, and know today, that the people and government of Kurdistan believe in peaceful coexistence and the rights of all nations and faiths to live in peace, and that they have no stronger advocate than the KRG.